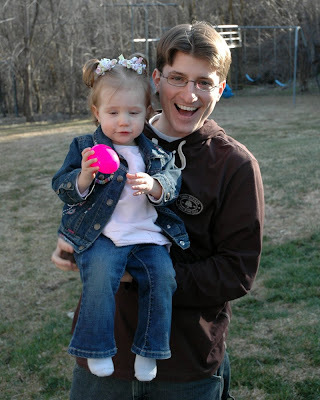 For Ava's second Easter, she participated in her first egg hunt. The quest for candy-filled plastic eggs took place in Granny O's backyard. As you can see, Larry was having as much fun as Ava (if not more). 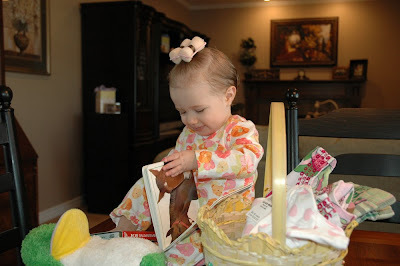 On Easter morning, Ava awoke to find an Easter basket for her on the kitchen table. 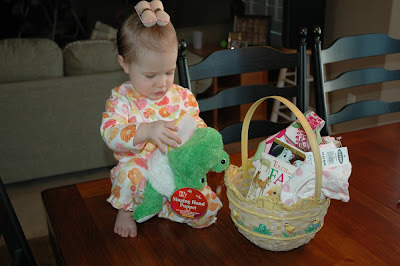 It was filled with a lot of fun things, including a singing frog and a DVD of Disney's 101 Dalmatians. Ava was determined to count all 101 dalmatians. 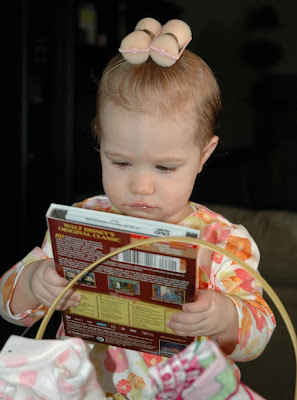 Her favorite Easter basket surprise was a book about animals. 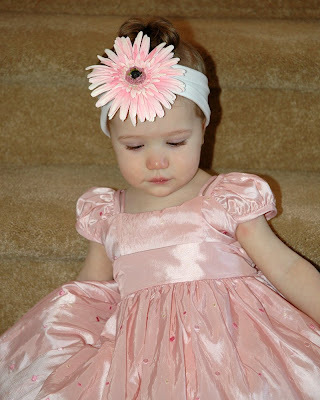 Then we got Ava into her Easter dress and sat her on the stairs for some pictures. 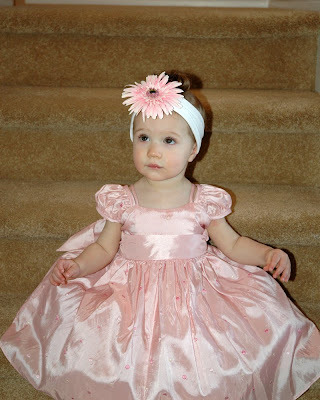 She was a little camera shy at first, so we had to jump around like fools trying to get her to smile for the camera. Although instead of smiling, she just looked at us like we were crazy. However, she finally perked up and even made the sign for "more". (Guess those signing videos are starting to sink in.) 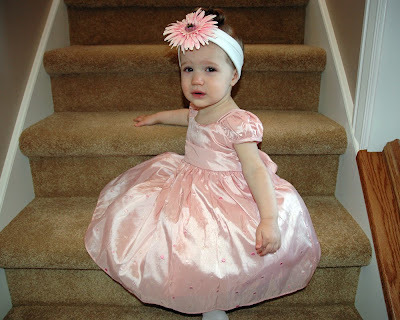 We assumed this meant that she wanted us to take more pictures. 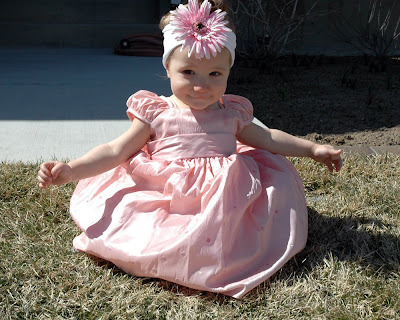 So we took her outside to continue the photo shoot, which made her happy again. Looks like you guys had a good Easter!! 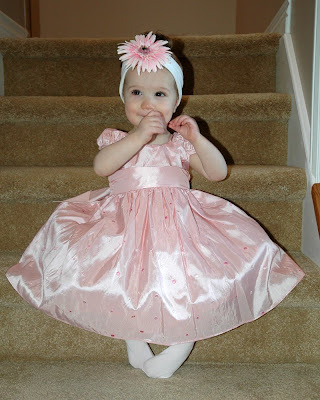 Ava is adorable as usual...I love the dress and the bow!! 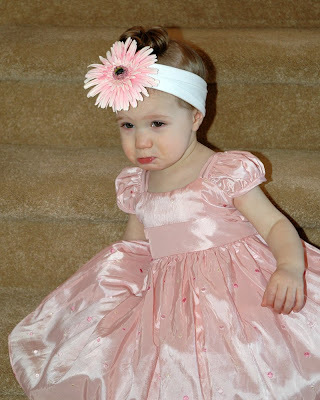 And her faces are too cute too!! Good job signing Ava! !